Own your own award-winning children’s entertainment business that promotes active play in a safe, clean, fun environment. This recession-proof business model is bound to bring jumpin’ fun times & smiles to everyone! Easy & fun business to own, run & operate with a proven model for success. READY TO JUMP INTO THIS NEW VENTURE? Owning your own Jumpin’ Jamboree franchise provides you with an opportunity to partner with a leader in the growing children’s entertainment market, which has experienced exponential growth in recent years. The children’s entertainment space is a vastly popular industry with highly profitable returns. Our Jumpin’ Jamboree franchisees will be fully prepared for success. Jumpin’ Jamboree has extensive knowledge in the indoor entertainment market and party industry, as well as years of experience in meeting consumer demands. Our facilities have brought children inflatable fun from outdoors to indoors at our comfortable, clean, safe and weather-proof facilities. Our company has responded to the needs in the marketplace and has excelled in the indoor inflatable entertainment and party space. The founders currently own 2 highly popular and profitable locations in the South Florida market, which started in 2012. There is a clear and proven model for success for the motivated, ambitious franchisee. Jumpin’ Jamboree is fully committed to your success as a franchisee and training is an integral part of that achievement. 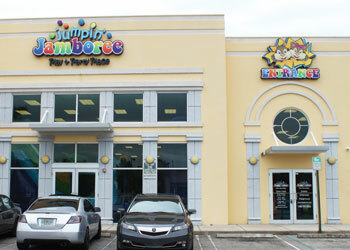 Initial capital investment required to start your own Jumpin’ Jamboree franchise- $484,000 – $688,000, which includes initial franchise fee of $24,900. DOWNLOAD YOUR FREE FRANCHISE KIT NOW! Fill out the form below to get your free franchise kit.